Need Help Finding Your Filter? Actual size: 24 1/2" x 6 1/8" x 3"
This Aprilaire 410 High Efficiency Air Cleaner MERV 10 will help improve your home's air quality, reducing the amount of airborne allergens and dust particles in the air. This quality product is only available for purchase online. Add Aprilaire 410 High Efficiency Air Cleaner MERV 10 to your cart and it will be on its way to you shortly. Would you like us to install it for you? Do you live in the Toronto area? Our qualified technicians can do a professional job for you. Call us today at: 416-620-6668. Not sure if this product is the right replacement for you? Call us now at: 416-620-6668. 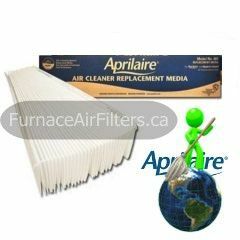 After my experience buying from Furnace Air Filters, I would definitely place another order. My new filter is exactly what I wanted - and it was much cheaper than I found anywhere else. I'm really happy with the professionalism, quality of service, and the product I received. I wanted to take a minute to say thank you to everyone at Furnace Air Filters. I desperately needed to change my filter but didn't want to break the bank to do it. When I found out they had discounted prices, free tax, and free shipping, my decision was definitely made easier! Thank you for putting your customers first. We ordered our Lennox furnace filter from Furnace Air Filters last month and were very impressed. At first we weren't sure if ordering online was the best idea, but placing the order was simple and straightforward and our filter arrived quickly. Thank you very much for the prompt and efficient service. I owe a lot to Furnace Air Filters. It was time to change my filter but I had no idea where to start. Their website was easy to navigate, informative, and made it easy to find the right filters for my home. Since they arrived, I have already started to notice a difference. Thank you for everything. My experience with Furnace Air Filters was a great one. I found the filters I wanted for a price I could afford. Before I knew it, they were at my doorstep! I was really wowed by how speedy the delivery was. Overall, I found Furnace Air Filters to be reliable and professional. I also really loved that they offered a wide range of filter brands. Thanks!